Stamford celebrate their second successive Lincs County Trophy success at Sincil Bank. Stamford AFC claimed back-to-back Lincolsnhire Trophy titles with a 3-0 win over Louth Town at Sinciln Bank last night (April 14). The Daniels forgot their relegation worries in the Evo-Stik Nortthern Premier League for a night as they beat their plucky lower league opponents. Stamford had to deal with being over-whelming favourites to lift the trophy for the second successive year at the home of Lincoln City and they struggled to break down Town’s well organised defence. In the second half the ever-impressive Dan Clements added a second for the Daniels before teenage debutant Jordan Neal scored the goal of the night, and one of Stamford’s best this season, using his pace to burn the Louth defence down the wing before cutting inside and dispatching a shot past Scott Drury in the Louth net. Louth played a phyiscal style of football all night as they refused to get bullied by Stamford, but shortly before the end it caught up with them as defender Rocky Rawlings was shown red and manager Paul Walden was sent to the stands for his angry reaction. Clements created the opening chance of the game, spreading it wide to Robbins, who stumbled, but recovered and then cut in and beat four defenders to get his shot off. It looked like a weak effort, but still it required a diving low save from Drury. But after half an hour Louth looked to be in trouble when Andy Rowlings brought down Stamford’s Jordan Smith in the box and referee Mr Wilson pointed straight to the spot. However the Daniel’s top scorer Robbins casually smashed the ball against the crossbar. Robbins soon made amends by driving into the box and pulling the ball back for Smith to smash the ball high into the net four minutes before half-time. Smith really should have scored his second of the night 10 minutes into the second half. Robbins shaped a beautiful pass into his path and Smith tried to hit it first time, but hooked it horribly over the bar. But while it remained 1-0 Louth were still in the game and Chapman had a chance to level it when a lucky deflection fell in his path, but Stamford skipper Richard Jones got back to make a vital block. And then, as has been the case on several occasions in recent weeks, Clements was the man to deliver for Stamford, this time with a skidding shot from 25 yards in the 75th minute. Just moments later Clements had a golden chance to get his second of the night. He put on the after-burners and raced clear, but tried the elaborate chip, and on this occasion he over-cooked it. Then came the icing on the cake. 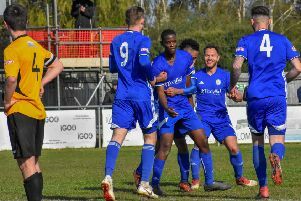 Just minutes after coming on for a cameo role 18-year-old Neal, who has been impressing in a struggling Uppingham Town side in the Peterborough League Premier Division, scored a goal to remember. There was time for tempers to fray after the third goal, but little more as the final whistle soon sounded and Jones lifted the county trophy once again.